This is a page dedicated to the memories of people who lived here before the park. Please contribute your memories too! My grandfather Alfred Robert Dear was born in the Golden Eagle Beer House on the corner of Trafalgar Road and Neate Street in 1908, after his family took over the pub the previous year. 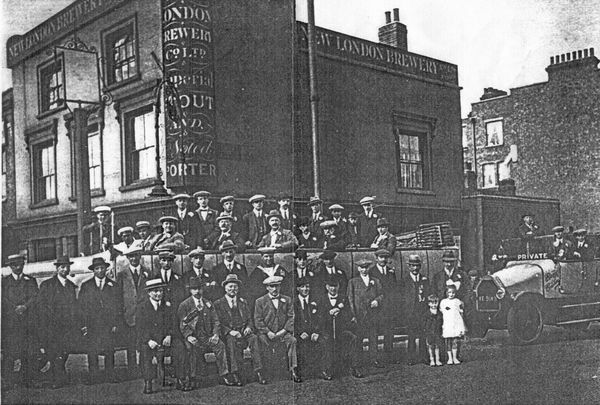 We have not been able to find any photos of the pub except for the one attached taken in 1921 that came to me through family. Sadly, we don’t know where they were off it that day. We think it was the south coast, perhaps Brighton. This photo came from my Great Aunt Margaret now passed, but I do have my grandad’s photo album which has pictures taken at Brighton when he was around that age. 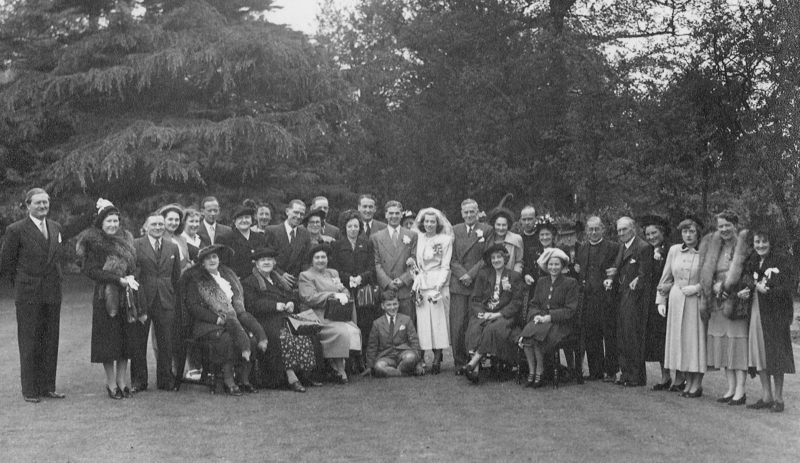 My great grandfather (the Golden Eagle’s landlord) is the chap with the bow tie in the front row. He always wore a bow tie on such occasions, so it’s not possible to tell for sure it was the same day. 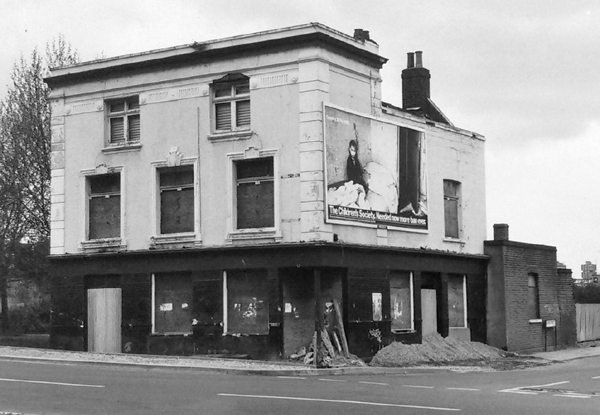 This is how the pub looked in 1986, shortly before demolition. A very sad sight. I visited on the open day along with my brother and sister on a nostalgic trip in September 2014. We had a tour of the bath house and told stories to the other visitors of our visits to the baths. At the time it was believed that there had been about 11 baths, going by the pipes that could be seen in the ceiling from the floor below. From our memories and after wandering around upstairs we were all sure there had been many more baths even being able to recollect a rough layout. I see from the drawing of the bath house on your website that there were in the region of 50 baths in cubicles, this would fit in much more with the number we thought there were. Also I’m still trying to find more information about the laundry for you. It seems it was an industrial laundry in the basement. Vans would bring the bags of washing (likely to be sheets and towels etc) and there were women who worked in there that would put the washing through the wash, spinners and tumble dryers. It would be folded and loaded back in the white linen sacks to be returned to the owners (possibly old peoples homes etc) I will try to find out more about this but not so many people left to ask. If I find any more info I will write again. When we came we were trying to find out about the Lime Kiln as none of us could remember it but we have discovered that when we were in New Church Road the kiln was surrounded by corrugated fencing. We have discovered a photo showing this and again the memories came flooding back. We also found a photo of New Church Road as it was when we lived there. In this photo of New Church Road, the reclamation/junk yard is where the phone box is, and you can see the bath house at the end of the road on the left hand side of the photo. We lived on the corner of Victory Square which is just visible as a tiny street on the right hand side of the road just beyond the third car. My family and I have been aware for many years of the development of the Park over time and of its recent refurbishment. We visited in the winter of 2013 but found it closed off because of the work being done inside. We came again on the 25th of this month, with my Birthday as the excuse for the outing. We live in Shirley so the park is not exactly local to us. My interest lies in the fact that, in my childhood in the 1930’s, I lived at No.57 Cowan Street. My son downloaded various old and not so old maps from the internet and, overlaying them, was able to determine with some degree of accuracy where that house used to be in relation to today’s landscape. It was very pleasing to find that it lay under what is now the tree-covered hill overlooking the north shore of the lake. Such a contrast to what used to be there !! Cowan Street was divided into three parts, which were separated by Jardin Street and Calmington Road running at right-angles to it. No. 57 was at the extreme eastern end of the middle section and the much taller buildings in Calmington Road overlooked our back garden, which was very tiny. 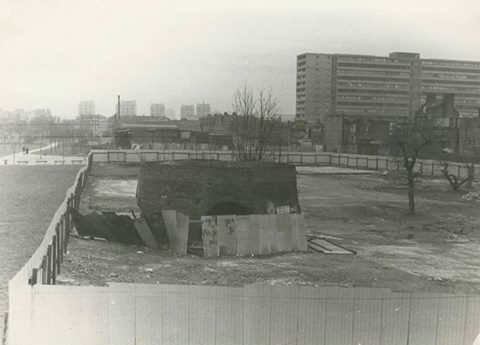 We used to say that the end nearest to Chumleigh Street was the “posh end” (there weren’t many children playing at that end), the other end was the “rough end” – very rough as I recall, and we in the middle bit were, well, just “respectable”. Posh or no, all us kids used to go to Saturday morning cinema at the Coronet and when the film started used to stand on the seats and cheer the “goodies” and boo the “Baddies”! I lived in Cowan Street from birth on 27th January 1932 until January 1941. During the Blitz we were bombed out. I was evacuated at the time to Yeovil with other children from Scarsdale Road School and some of the teachers. My Mum and Dad were trapped in their Anderson shelter, which had got buried with debris from the houses overlooking us in Calmington Road. They had to be dug out – fortunately they survived. It was lovely to see the area as it is now. To have a lake is a real bonus. We actually saw a cormorant when we were there. Who, back in those days, would have thought all this possible? One disappointment, the footbridge was not open. Many times as a child I walked or pushed my tricycle over that bridge and was looking forward to walking over it again. I have heard it said that there were plans after the first world war to turn this part of Camberwell into a park. I think those plans were interrupted by the next war. It’s good to know that it has now come to pass, no doubt through a great deal of hard work by your organisation and others. Thank you for that. 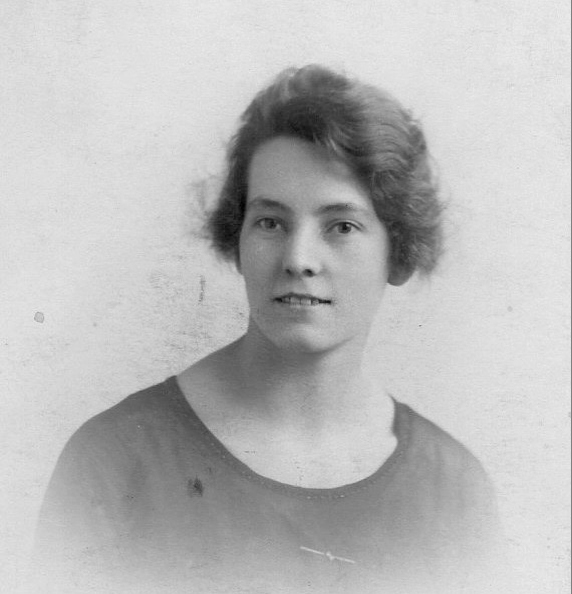 My great grand Aunt Clara Mills (nicknamed “Doll” possibly deriving from “Dolly”) was born in 1891 and was the ninth of ten children by Stephen and Jean Mills. Stephen was the son of a ropemaker from Hayle, a village on the north Cornwall coast who came to south London in the late 1860s to make a new life. 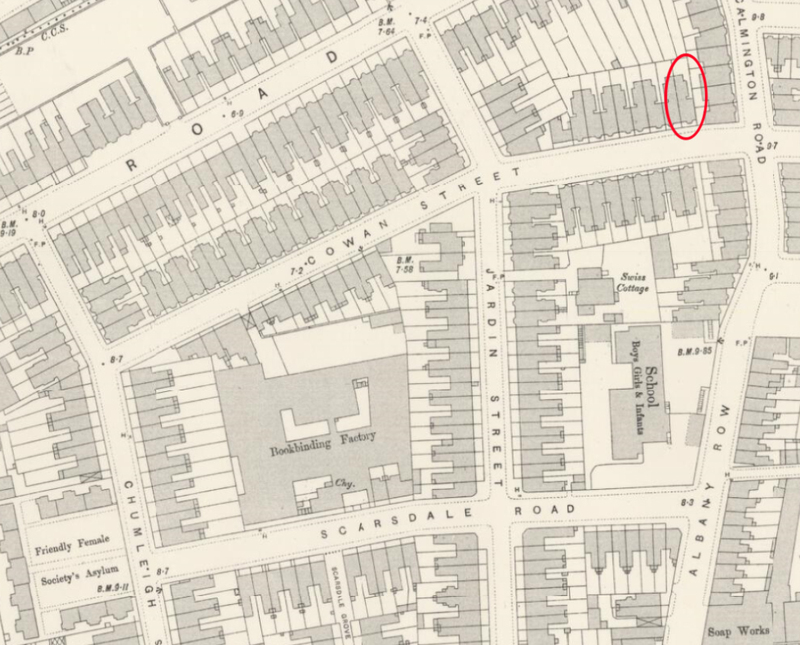 The Mills family (already with at least six children) came to live in Camberwell during the mid 1880s and moved into 292 Albany Road, just a few yards from the junction with Portland Street. I assume it was a very ordinary flat in one of the many tenement buildings on Albany Road at the time. According to the census records, Stephen and Jean were still resident at this address in 1911, so I assume that all of the ten siblings would have lived at 292 at some time before leaving the family home and moving on. The photo below shows a portrait of Aunt Doll taken a little before WW1 making her around 20 years old at the time. In the years leading up to WW1, Aunt Doll and her older sister Alice (nicknamed “Al”) both had jobs as packers at the Cross & Blackwell preserves and pickle factory, either in Blue Anchor Lane or Lynton Road, Bermondsey, just a half mile or so from home. I think Alice was already married at this time. My great grandmother Sarah Ann Mills, born in 1875, was another of Aunt Doll’s three older sisters. 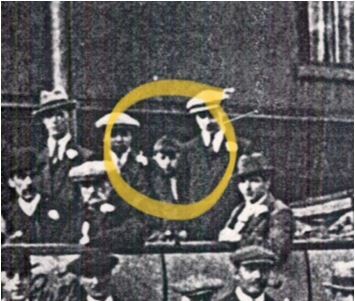 Sarah Ann married Thomas Redman in 1899 and they moved in next door to the Mills family at 290 Albany Road from then onwards. They had three children; my grandmother Kate Emily born in 1900, and then Frederick William and Alice Maud (nicknamed “Dinks”) a few years later. During or just after WW1, Aunt Doll had moved into the downstairs flat of an early Victorian terraced house at 104 Albany Road, about 200 yards from the well-known “Thomas A’ Beckett” public house at the junction with the old Kent Road. In the 1920s she found employment as a clerk with HM Inland Revenue Service and continued there until her retirement around 1954. She never married. My grandmother Kate Emily, married Algernon Harry Scott in Camberwell in the summer of 1924 and my father, Arthur Frederick (nicknamed “Freddie”) was born in East Dulwich Hospital in the November of the same year. They lived for a year or two in Albany Road before moving to Walthamstow but they still visited their relatives in Camberwell on a regular basis well into the 1950s. Aunt Doll was in fact my grandmothers aunt and because of their relatively small age gap, had always been quite close. She was also my dad’s favourite great aunt. After hearing stories about the R.Whites distibution depot on the corner of Bagshot Street and the main factory premises in Neate Street, I can now understand why my dad had such a close affinity to the R.Whites brand name. Creme Soda became my absolute favourite fizzy drink growing up in the 1950s & 1960s. After the death of my great grandfather Thomas Redman in the mid 1930s, great grandma Sarah Ann Redman moved into the upstairs flat at 104 Albany road where Aunt Doll could keep an eye on her. Sarah Ann lived there until her death in 1950 and the upstairs flat at 104 Albany Road was relet to a guy called Frankie Merritt who was still living there the last time I visited Aunt Doll together with my dad around 1971. The five Camberwell relatives standing from left to right: Alice Maud Worth nee Redman, Freddie Worth, Jean Charlesworth nee Mills, Shirley Worth, then another of my mums cousins, then Clara Mills (Aunt Doll). The three Camberwell relatives seated from left to right are: Alice Parish nee Redman (Sarah Anns sister in law), Sarah Ann Redman nee Mills , Kate Emily Scott nee Redman. The author of this article, Martin Richard was born two years later to Fred and Joan Scott in Thorpe Coombe Hospital, Walthamstow on the 22nd May 1951. We moved to Harlow in south west Essex in late 1952. Aunt Doll’s ground floor flat at 104 Albany Road was a typical 1840s London terraced house with a narrow gabled roof hidden behind a plain brick house front. A short “extension” at the garden end housed the kitchen/scullery with access to the outside WC. The flat was still lit by gas lamps in the early 1950s when aunt Doll very reluctantly had to make the changeover to electricity. 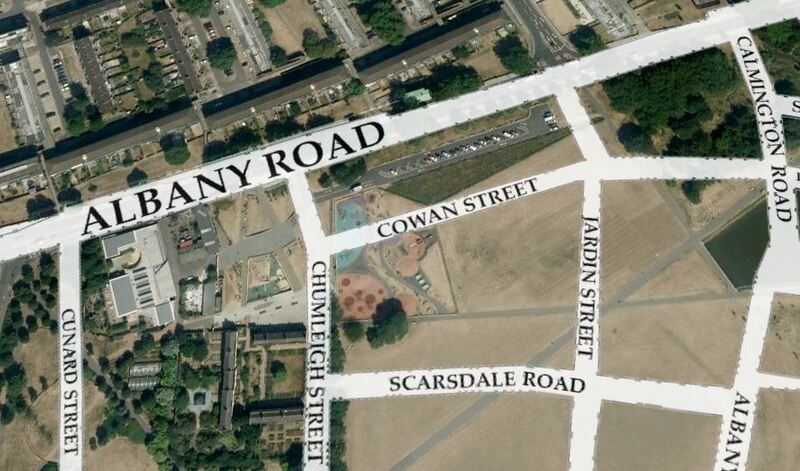 (which we often missed) and instead had to turn next right into Cobourg Road or even Trafalgar Avenue and then double back to find our destination. The daytime journey in the 1960s was only about 75 miniutes. Aunt Doll’s flat at number 104 was furnished with many old carpets some of which were threadbare and lots of heavy dark oak furniture. A similarly aged and always out of tune upright piano stood against one wall in the front room. She could read music and had apparently been quite an acceptable piano player in earlier times although I never heard her play. There was always a slight smell of mothballs in the air which added to the very tired feel of the interior. There was no central heating and no double glazing of course so the house was always cold, especially the front room which was never used. The kitchen had become the “living room” for which the trade off was very little daylight making it quite dark and where myriads of biscuit tins, jam jars and tea caddys adorned the shelves and filled the cupboards. She had also been a “spiritual medium” of some notoriety within the family which was perhaps another reason why the front room was always cold. Aunt Doll’s length of residence in Albany Road spanned most of her life from the early 1890s until the early 1970s. After fifty years living at 104 she became slightly infirm and moved into Woburn Court, a sheltered home for elderly people in Bermondsey in 1972. I visited her there just once around Christmas 1973 still to be greeted in her ubiquitous “Ena Sharples” hair net. She died in 1975 aged 84. My parents attended her funeral, which I think took place at Nunhead cemetery. In spite of WW2 bombing and extensive redevelopment of the area, fate has decreed that the terrace of houses including number 104 are still standing today and indeed must represent the last examples of early Victorian buildings on Albany Road, albeit completely modernised. Some are no longer downstairs /upstairs flats but have been converted into houses. I hope this short article is of interest and may even have jogged the memories of people with their own stories of Albany Road or perhaps others who may even remember the names of some of my distant relative from Albany Road! It was after all a large family. Hi I live in Sydney Australia, so research is so difficult being so far away. I, my two sisters and parents lived at 21Caldew Street which ran between Addington Square and Cheam Place. It ran parallel to New Church Road. I did find some photographs of Caldew Street on the internet but unfortunately they have since disappeared. We lived there from 1939 till about 1955. Like many others l used the public baths in Wells Way. As l was only able to pay for 2nd Class sometimes l had to suffer the indignanty of the attendant opening the door to tell me to hurry up. 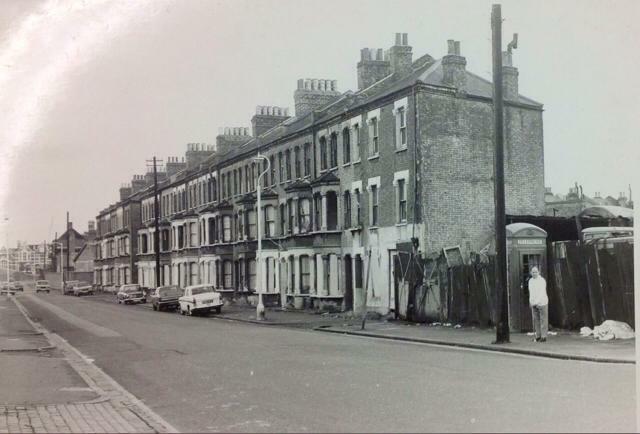 I returned to the area in around 1965 to live at the New Church Road end of Southampton Way. My neighbour, who went to the public meeting about the proposed creation of Burgess Park, told me of a well spoken man who protested that the size and shape of the proposed park was perfect for the landing of light aircraft and could assurances be given that it would not be used for that purpose. Like many others l have fond memories of the area but l do wish l could discover those photographs again. Thanks so much for sharing these memories! Fascinating stuff – especially the bit about the light plane landing. That will now re-enter local folklore, I can guarantee! I had a bit of a search around and found a few photos of Caldew St here on the Museum of London Website. These were probably taken by the GLC shortly before demolition – they did a good job of documenting their work! Do let us know if you spot your home in one of these, and we’ll get permission to include it on this page. My Nan lived at 29 Caldew street – the family name was Granger. I lived in Ewell Place backing on to Caldew street, facing the canal. I went St Georges school in New Church Road till about 1955. I remember most families in Caldew St as my cousins also lived there. Thank you so much for discovering those pictures of Caldew Street, some of them were the ones I had seen on another website but were unfortunately deleted. There are two pictures of the ‘ odd numbered ‘ side, one from each end, but 21 is at the far end of each one. In my childhood memory the houses did not look so bad but the ‘even numbered side’ are just as I remember. Comparing the two sides I can understand why the ‘evens’ had electricity and we had only gas. I must clarify that no light aircraft actually landed on the park just that the man was using the possibility as a way of protesting against the park’s creation. Thankfully his unrealistic fears were ignored. Anyone remember Mr Shroeder at St Lukes Sumner Road? Yes I do. My name is Ken Cameron and I was at St Luke’s in the 60’s when he was head master. Anyone remember the king family len and Mary of 104 new church rd then 53 rainbow street? ?